Right from the outset, you can tell that Pilgrims Progress is a comeback record for for English psych-rockers Kula Shaker. Opening with irresistibly baroque first single “Peter Pan R.I.P.” – a gorgeous, melancholic, cello-driven pop-rock ode to that most famous of lost children – provides the setting before moving on to the even more precious (and just as fantastical) chamber folk ditty “Ophelia”. The decidedly more rootsy psychedelic blues number “Modern Blues” also shapes the diverse sound. “Only Love” – a driving, insistent faux call-and-response session that boasts a healthy dose of jangling Byrds-ian Rickenbacker and some three-part harmonies to die for (the response to each call, incidentally, is that “only love will take you there”; but you already knew that) – makes it become quickly apparent that Pilgrims Progress’ infinitely-varied forty-one minutes are going to be playing host to the entire gamut of the musical spectrum of the late ’60s and beyond. The irresistible sitar-driven country shuffle (!) “All Dressed Up (And Ready to Fall in Love)”, the near-Adam Ant/Wild West instrumental “When A Brave Needs a Maid”, and the hauntingly desolate ballad “Cavalry” – which relays the desperate tale of an outnumbered and demoralized group of soldiers (“We can’t turn back, we’re under attack / outnumbered too, I believe”) – sound like they could be out-takes from a Ennio Morricone soundtrack. Brian Eno’s music is constantly fascinating. Even since his work with Roxy Music, the revered Eno has played with a variety of musical styles. Quality mood and atmosphere is a constant in his work though, regardless of what his medium presently is. His new album stirs up some of the most interesting soundscapes in some time. Sounding both industrial and lush, you could easily set Small Craft on a Milk Sea to a game or movie with barren, otherworldly landscapes. Maybe something like Metroid or The Elder Scrolls. “Paleosonic” – with its tropical-like percussion – may bring to mind Super Mario Sunshine instead. Well, initially. The initial percussion is complemented by darker grumblings of distorted guitars, which eventually evolve to high-pitched solos that would sound improvised if not for their excellent placement. The whole track grows in tension as it progresses, the second half ushering in some alien-like synths that go from minimalist to scraggly and dominant. The synths, percussion, and guitars collide at the end for a truly sensational effect – one that sounds as if they are all coming back to orbit. It is amazing how songs like this build and progress on Small Craft on a Milk Sea, but hardly surprising considering Eno is at the helm. Although Small Craft on a Milk Sea is far from accessible, anyone interested in the world of music soundtracks, ambiance, or any electronic sub-genre will find extreme pleasure here. There is nothing that truly sounds like this album, even if tracks like “Flint March” bring early IDM to mind with its percussion-heavy rumblings setting itself over unremitting bass-synths. Something like “Calcium Needles”, on the other hand, has no percussion and is purely an ambient track. You could easily picture this playing as snow falls over an abandoned factory; the lifeless and ominous feel of this track should be present to anyone, and this is what Eno has always been best at. He relays soundscapes that leave open interpretation, but are cohesive enough to form a universalized concept of his intentions. 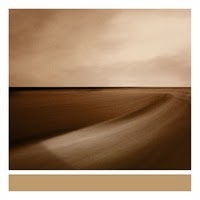 There are many different efforts on Small Craft on a Milk Sea, and although it lacks the cohesion of his earlier works it is definitely something fans of electronica should seek out. Aspiring electronic artists could definitely learn quite a bit from this accomplishment. 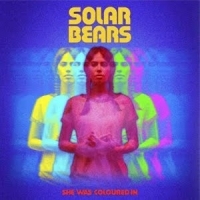 John Kowalski and Rian Trench named their band Solar Bears as a tribute to famed Russian filmmaker Andrei Tarkovsky. The two had always shared a love for cinema, but it is hard to say if it ever trumped their love for music. Particularly, they respect filmmakers with the “ability to paint a vivid landscape with a relatively minimal palette; creating resonant textures from very little”. Their atmospheric music certainly carries a similar ideology.As one of the better electronic debuts of 2010, She Was Coloured In shows this young duo’s degree of flexibility. They can at one point sound like a producer of lullabies, with soft sweeping synths collaborating with luxurious orchestral elements, like the lucid twinkle of arpeggios in “Solarization” or the exotic “Cub”, which dabbles in woodwind-like sounds over chirpy synth pads. That a song called “Quiet Planet” represents one of their more rambunctious works is ironic, but it certainly show their infectious works more in the vein of a Röyksopp or Ratatat. Their restrained efforts may be more impressive though, at least for those accustomed to more organic and atmospheric works by artists like Kraftwerk and Yellow Magic Orchestra. It is hard not to at least have a soft spot for Vampire Weekend, even if their songs are played so much that tiring of them becomes easy. It would be insane for criticize a band for this though, as their infectious songs are wide-reaching enough to appeal to any listener – indie-rock student or not. Ezra Koenig and co. produce a bouncy fusion of indie-rock and Afro-pop, with the percussive ferocity of the latter simplified to produce an amiably accessible sound. Perhaps the four-piece will pursue ambition further in the future, but Contra serves as a safe follow-up to their very successful self-titled debut. Koenig’s sputtering but airy voice rarely alternates from familiar delivery, but like Phoenix the group employs a variety of hooks simple and predictable enough to retain themselves in anyone’s memory for days. Their colorful tunes have just the right amount of repetition too, as there is nothing wrong with simplicity if efforts to diversify content are apparent. 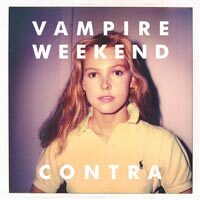 With Contra, Vampire Weekend have taken in step forward in at least one aspect: diversifying songs on the album from one another. Vampire Weekend have a very distinctive sound, but their vein of simplified Afro-pop and indie-rock occasionally appears as a struggle in its natural avoidance of variation. You have the trickly synth progressions on tracks like “White Sky”, the halted vocal progressions on “California English”, and the furiously high-tempo rhythm in “Cousins”, but the songwriting is commendably more varied than ever – even with elements like this making reoccurring appearances, just like on the debut. Koenig is masterful at rhythmic vocal deliveries; the lacking element of intricate percussion is adequately substituted for in Koenig’s admirably enthusiastic delivery, which coincides beautifully with the chugging rhythms. A song like “Taxi Cab” is as subdued as the band is likely to get, with a traditional piano fluttering across the track in a more subdued manner than usual. The orchestral flourishes occurring around the two-minute mark are a good example of this, serving as one of many indicators that Vampire Weekend’s next album may seem them peek further into unexplored territory. 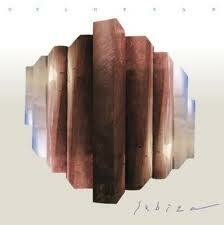 As usual, a commendable job by one of the biggest successes in indie-rock so far this decade. Continuing the surge of experimental-pop from Montreal, Pop Winds excel in diverging colorful psychedelia and indie-rock to create a sound that is familiarly addictive, yet still relatively incomparable. On “Owl Eyes”, the trio’s vocals combine for multiple harmonies over squirts of brass and synth arpeggios, the wide variety of synths sliding and squirming all over their creative palette to create a sound that is more majestic electro-pop than 16-bit SNES tributes. It would be fairly easy to compare Pop Winds to Animal Collective’s more accessible works, recently “My Girls” and “Summertime Clothes”, simply because they specialize in similar arsenals and are able to show their experimental chops while keeping it initially engaging. 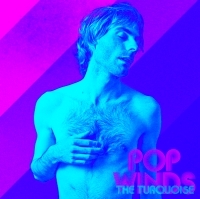 But it would be more justified to name The Helio Sequence instead, as Pop Winds certainly show more pop than psychedelia through song structures that are traditional and somewhat restrained, even if percussive and melodic elements travel with greater ambition than most pop groups. 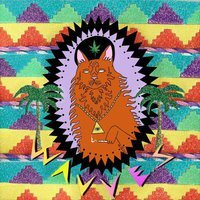 Delorean craft majestic electronic music that does not quite align with any recent popular “sub-genres”, like chillwave. I would put them more in the vein of The Tough Alliance. Like the tinge of soul provided by the backing sample in “Stay Close”, or the gliding guitar progressions in “Grow”, Delorean showcase a distinctively European style of electro-pop that leans on dance and house more than indie-rock. The arena-ready glitter of their songs avoids the superfluous production of peers, thanks mainly to Delorean’s grasp of traditional dance elements refined in a futuristic sphere. Lead vocalist and bassist Ekhi Lopetegi packs a nonchalant and airy tone somewhat comparable to Johan Duncanson. His vocals are never a dominating factor, but the group’s outstanding production interweaves it with glittery keys, pulsating bass drums, and sonorous vocal samples to practically sound like an incorporated woodwind instrument. “Stay Close” is certainly more in the vein of Cut Copy, especially with Lopetegi’s brasher vocal presentation emerging a minute in. A bunch of pulsating keys back up a choral type of vocal presentation, with the female soul croons borrowing a bit of what Burial did so well on Untrue. At times, Subiza sounds like a brighter version of that, where infectious appeal appears more desirable than moody atmospherics. It is a song with too much variation for a club, but certainly touting enough dubstep and dance influence – particularly in the lead-in synth – to serve as a stellar meshing of two genres with occasionally conflicting production styles. It is easy to get wrapped up in Delorean’s dance-friendly tag, sure. There remains a nostalgic appeal throughout the album though, which resonates in a manner similar to Air France’s No Way Down EP last year. Unlike that album, Delorean are less concerned about floaty child-like atmospheres with whimsy than they are about instrumental arsenal. Unlike the evolving harps and sampled laughter of Air France, Delorean produce a more frenzied version of sample-laden atmospheric dance-pop that encourages both movement and contemplation. Lopetegi’s presence is felt as a vocalist, but even he is overshadowed by eclectic use of samples ranging anywhere from soulful vocal accompaniments to tight shrills of brass. It is part of their strength that his vocals may not even be necessary, as the songwriting and hysteria contained in the production are exciting enough. Delorean are certainly growing up as songwriters and producers quickly. If Funeral was the personal homage to life, love, and loss, as Neon Bible was a straight shot at the gut of political immoral corruption, then Arcade Fire’s The Suburbs is merely a simple acknowledgment of the two concepts. Not to mention, the powerful realization that “we can’t run from our upbringing”, especially when two-story brick houses and shopping malls stand in our way. 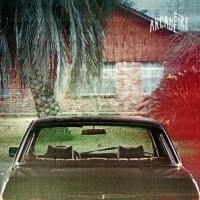 And as Win Butler and company convey on their third album, each new generation is engulfed in a more brutal “suburban war.” With so much indie cred on the line, Arcade Fire delivers once again with their longest, most expansive album yet. The Suburbs starts appropriately, with a title track that works as both a contrived summary and introduction to the fifteen songs that follow. Although not the strongest of the album, it serves its purpose. It then rolls into “Ready to Start”, which is a typical bombastic collective of Arcade Fire proportions, a jump-the-gun type of song. “Modern Man” is where the beauty and originality of the album starts. With lyrics that could strike the hearts of Bowie fans, it questions what to some might be obvious, but to many is obscure: is the modern world in a productive progression? 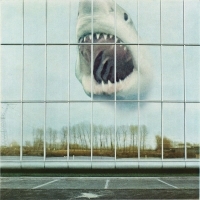 Wilderness Heart was recorded in Los Angeles, a decidedly different environment from Black Mountain’s Vancouver home. The production comes courtesy of Dave Sardy (Nine Inch Nails, LCD Soundsystem) and Randall Dunn (Boris). Both of these elements are foreign to a band who self-recorded their debut album and most of their sophomore. McBean said as much in an interview: “…we wanted a bit of a surprise for ourselves, to take a bit of a chance.” That chance has paid off in big ways. Not only is Wilderness Heart the most cohesive Black Mountain album to date, it is also the most accessible without straying too far from the attitude that has brought McBean and company such critical acclaim in the past. The Hair Song” opens the album with the most prolific duet McBean and female vocalist, Amber Webber, have ever produced. The song’s general upbeat tempo has more of a mid-70s city park-performance vibe than an early 2000s sound. It’s layered with excellent guitar work, mesmerizing lyrics and an overall fun feeling. All of this leads perfectly into the more somber “Old Fangs”, which retains the near-same level of musical energy whilst tempering the vocal aspect and raising the instrumental grandeur. Kanye seems destined for perpetual controversy, just like the varied placements of his new album on year-end lists. 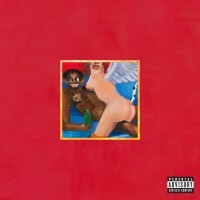 My Beautiful Dark Twisted Fantasy achieved arguably the most glowing reviews out of any album in 2010, but I cannot help but think one looming aspect influenced the decision of many publications: that it seems a lot more fun to talk about Kanye and his music, rather than listen to it. My Beautiful Dark Twisted Fantasy will always be considered Kanye’s quintessential critics’ album, where those who consider him a lyrical genius are treated to a massive array of content, perhaps too much so. The majority of efforts on My Beautiful Dark Twisted Fantasy would be considered “epic” by fans based on their lengths alone; nine out of thirteen tracks on the album near or exceed the five-minute mark. For a typical track here, the same background loop repeats incessantly with little variety. Tracks like “Power” and “All of the Lights” are some of Kanye’s best for sure, but even “Power” treads on way too long. When substantial variation is only defined by guest appearances, over-indulgence becomes a potential issue, especially when songs with two minutes of legitimate musical content are stretched out to six minutes. For-hire guitar licks at the end of each song do not serve as a satisfying conclusion, either. Those who find this album to be a top-five contender could point to Kanye’s lyrical prowess, claiming the seven minute songs are filled with unparalleled lyrical wit and passion, and that the beats are only supplementary. Perhaps, but considering Kanye wrote songs – with hooks and variation – on ALL of his other albums, My Beautiful Dark Twisted Fantasy sounds slightly weak in comparison. At least 808s & Heartbreak attempted unique stylistic consistency. His lyrical quips on My Beautiful Dark Twisted Fantasy even sound half-assed compared to earlier material, as if he wrote a ten second loop, repeated in thirty times, and then sporadically wrote down topically irrelevant quips as they came to his head. On a listening level, many of the songs hold as much substance as reading a pamphlet with all the lyrics inside. The words feel shamefully detached from the mundanely repetitive beats, whose infectiousness wears thin after the sixth or seventh time around (which often occur within two minutes). Rolling Stone said “nobody else is making music this daring and weird” in relation to Kanye’s My Beautiful Dark Twisted Fantasy. That is a a reach to me. For someone who has touted his originality in such daring ways for the genre before, this album comes off as repetitive and uninspired with over-indulgent repetition that only barely supplements lyrics that will make 9th graders grin from ear-to-ear. But beyond that niche, I am not sure how anyone accustomed to well-written lyrics and/or music can even place this in the top 20. The artistic value here is too minimal for higher placement. Kanye has done a lot better. Did you really listen to 50 freaking albums? That sounds pretty painful dude. I’m sure it was tough to pare down from 100, even. The writing here is terrible. As is the quality of the reviews as a whole. “…this album comes off as repetitive and uninspired with over-indulgent repetition…” Try editing yourself. Great, finally someone gave to the Arcade Fire album some “basic” review: a not brilliant album and not like any other past two albums, I felt cheated by the album. In general, for me, are good and well made reviews. a little bummed that arcade fire is so high on the list.. especially higher than kanye west? can’t say i agree with that. on the bright side i appreciate this new list of music to check out. thanks! This site is a reference of quality to me. Sometimes I even quote the site on my personal blog. Keep the good work! I’m confused. Kayne’s album was the 41st best album of the year, but it stinks, and that’s why it’s 41st? Seems like you didn’t think it was one of the year’s best, but you put it low on the list so you could rip on its placement on other lists. And “obscure” sound? Half of my sophmore class has this album. Robby: I’m not an elitist prick that only lists albums that are deemed “obscure”. there are other sites for that though, I’m sure. these are the best albums of 2010, not the best “obscure” albums of 2010. please make me aware if the feature says otherwise. the top 3 includes Big Boi and Gorillaz; these are two artists that I’m sure half your sophomore class has as well. does that mean I should discriminate against these great albums? of course not. Kanye’s album doesn’t “stink”. it’s better than nine albums on this list, in my opinion. my summary of the album expresses criticism because I KNEW the sheer placement would elicit questions, so I wanted to preemptively respond to such. who wants to read a glowing review of why the Kanye album is decent for the millionth time? read the gushing, hyperbolic reviews from Pitchfork and Rolling Stone in that case. I preferred to explain why the album is so low on the list, as opposed to exclusively praising the scattered positives (which I did actually touch on with “All of the Lights” – the write-up highlights some of the album’s strengths too). as I wrote, the two or three good songs, the production, and lyrics are the only reason the album is on this list. the loop-based “songwriting” – with no cohesive and/or creative structure to speak of – fails to impress me even slightly. Kanye is allowed resources that are vastly significant compared to most other artists here, and he is judged with that in mind as well. consequently, with his broad reach and slew of cameo stars in mind, I find the album lazy – even with the handful of highlights that propelled it from number-less to #41. I apologize if this list is not elitist enough for you, or for anyone seeking something similar. Nah, most of those kids aren’t exposed to anything decent. The student I was thinking of that was loving Kanye’s new album has moved on to Diddy’s new one, not the Gorillaz. Anyways, I actually loved the list. I was just pointing out how much Kanye just has to be mentioned, if only to offset the inevitable question “where’s Kayne?”. I thought that Pitchfork and RS were more interested in talking about Kayne’s self-obsessed year in the news than the music on his album, so that’s why I didn’t care for fheir picks. And, if only a handful of songs are impressive on it, then why not give a nod to to “Brothers” or “Expo 86”? Carry on, Mike – it was a nice list. I have to say though, the reason I read this site is because I tire of Pitchfork and other more popular music news sources. If that makes me an elitist (someone who reads it); what does that make you (the author)? Robby, I was not calling you an elitist. I was only saying that those who seek year-end lists with strictly “obscure” content may resemble such. I was arguing I am not an elitist at all… I’m just looking to expose great music in this particular feature, whether you heard of it or not. Most of the site’s features – not this Top 50 – do involve artists who are either unsigned or relatively unknown. This cumulative one is different though. The absence of albums like Wolf Parade is certainly a valid criticism. if I went into the 60s they would surely be there… but in my opinion they just barely fell below the other albums in the list. I’m a huge Spencer Krug fan, but Wolf Parade’s new album did not particularly excite me compared to their earlier material. Keep in mind, his Sunset Rubdown material always seems to make the top 20. I’m glad you enjoyed the list though. I certainly am receptive to recommendations on what I missed… there’s definitely no way I captured the greatness of 2010 with one Top 50 list. I just personally don’t judge music based on popularity, and I know you don’t either. I was just clarifying such to avoid confusion… I apologize if you took it as offensive in any way. I’ve got $20 on Mike in this discussion. Thanks for compiling this list. Good variety. That’s a pretty good list! Thanks. Thanks for placing Kanye outside the top 10, and Arcade Fire. You seem to care, because you don’t seem to be clinging to the hype machine.